On December 14-16, 2015, the Auschwitz Institute for Peace and Reconciliation (AIPR) held a training seminar in Kampala, Uganda entitled “Genocide and Mass Atrocity Prevention in East and Southern Africa Today: National Committees for Genocide Prevention Learning from Past Experiences, Facing New Challenges”. The seminar was carried out with the support of the German Federal Foreign Office and involved the participation of thirty individuals from regional governments, National Committees for Genocide Prevention, and civil society organizations in the region. The goals of the seminar were two-fold. First, the training looked to provide background information, past experiences, and lessons learned as well as the space to discuss new challenges in relation to thematic issues involving the work of National Committees on Genocide and Mass Atrocity Prevention in the Great Lakes Region of Africa. Second, the seminar sought to provide state leaders and members of current and potential future national mechanisms with policy and programmatic recommendations towards sustainability and the expanded institutionalization of the prevention of genocide and mass atrocities. 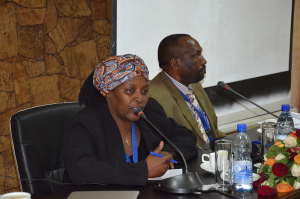 Introductory remarks were made by AIPR’s Director of Africa Programs, Dr. Ashad Sentongo, and Mr. Nathan Byamukama, The Director of the ICGLR Regional Training Facility on Gender and Sexual Based Violence. Throughout the first day, participants engaged in a series of modules and discussions centering on the themes of youth engagement and the prevention of electoral violence. 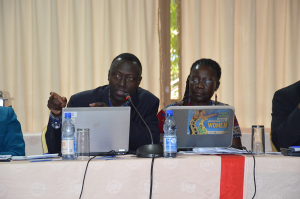 The second day involved a presentation on the “domestication of genocide and mass atrocity prevention” by a member of the Ugandan National Committee and multiple modules on the issue of paramilitary mobilization in the Great Lakes Region. On the final day, members of Kenya and Tanzania’s National Committees on Genocide Prevention discussed the operations, successes, and lessons learned from institutionalizing of National Committees which was followed by a module on the relationship between natural resources management and genocide prevention, and an exploration of localizing early warning and response systems in the Great Lakes Region. The Seminar’s proximity to Burundi and the contemporary relevance of its subject matter added to the urgency of the discussions and highlighted the crucial nature of the work being undertaken.The avid participation of the attendees made for an engaging and productive program and, as a result, the Seminar produced a significant number of concrete action points, which will guide future efforts in the region. The Great Lakes Region is plagued by continuing cycles of political, electoral and intercommunal violence, mobilized by elites and perpetrated by the military and the youth. The seminar was therefore a timely initiative that provided insights into the causes of these issues and generated policy and programmatic recommendations that governments and civil society can implement towards prevention.